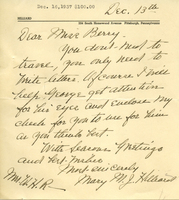 Mary Hilliard tells Martha Berry that she doesn't need to travel, only to write letters. She then agrees to help George get attention for his eyes and informs Martha Berry that a check is enclosed for that purpose. 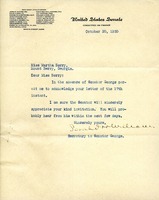 Letter to George F. Johnson from Martha Berry informing her that she had been thinking about George and hoping that he is well and strong. 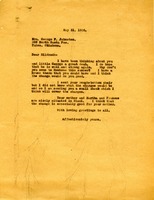 She then invites them to her house in Mentone, Alabama for the summer. She informs Mrs. Johnston that she sent her her rough bottom chair to her but that she did not know what charges there would be so she sent a check to cover the charges. She then informs Mrs. Johnston that her mother, Martha, and Frances, were already settled in Miami.